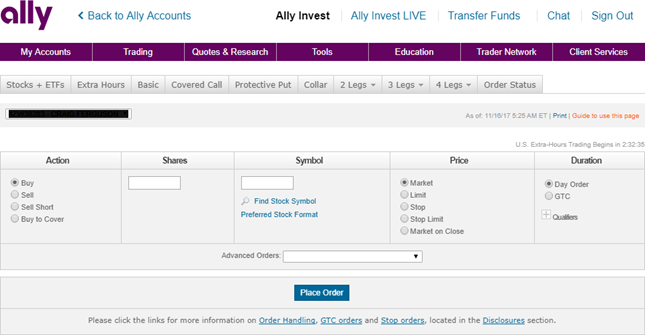 So you just opened an Ally trading account? Cool! On this page I'm going to show you how to trade your first stock. Buying your first stock can be a little intimidating because you are worried that you might do something wrong. I can remember that my hands were trembling when I bought my first stock! Don't worry. I'm going to show you how to do it. On the order entry screen you will see 5 sections: Action, Shares, Symbol, Price, and Duration. Action - This is where you specify if you want to buy, sell, short, or cover a stock. If you are just buying a stock then click the buy button. Shares - This is easy. Type in the number of shares you want to buy. Symbol - Type in the ticker symbol. Price - Put in the type of order. 99% of the time just leave this on Market unless you are putting in a stop loss order. Duration - This is tells Ally if you want this order only good for the day (Day Order) or until cancelled (GTC). Leave this on Day Order most of the time. This now tells Ally to place an order to buy 100 shares of Tesla at market and it's good for the day. Now just simply click the Place Order button. Your order will be filled in 2 or 3 seconds and a shiny new car will be delivered to your house tomorrow morning. Just kidding! Congratulations on buying your first stock! And when you are ready to sell that stock you will click the sell button (under Action) instead of the buy button. Everything else stays the same. Want to short a stock? Click Sell Short (Under Action) and type in the number of shares and the ticker symbol. Place your order. Once the stock moves down and you've made a profit you simply click Buy to Cover. That's it. Trades cost $4.95. That's less than TD Ameritrade or E-Trade. Trade stocks directly from the mobile app (gets 5 stars). Include streaming charts with technical indicators. Many tools available like stock screeners, calculators, and alerts. No minimum deposit required and no hidden fees. I'm happy with Ally. It's easy to use, inexpensive to trade, and my orders get filled quickly. I don't really know what more you could ask for. Have any questions? Send me an email and I can help you trade your first stock!